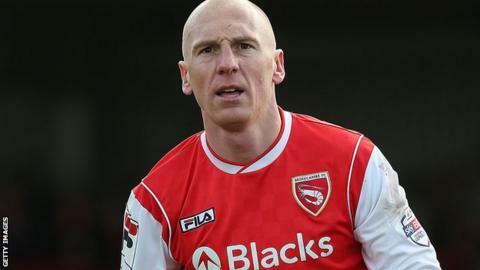 Manager Jim Bentley has praised Kevin Ellison and expects the veteran winger to continue making a positive impact for League Two leaders Morecambe. Ellison, 35, has scored four times in the Shrimps' first three league games. "Sometimes people knock him and look at his age, but I don't have all that," Bentley told BBC Radio Lancashire. "He looks after himself and does everything away from the club that he needs to do to give himself the best chance of performing on a matchday." Bentley added: "He's started off great and long may it continue, but we'll make sure that we manage him. He certainly manages himself and I'm sure he'll have a successful season again." Morecambe have collected maximum points from their first three league games and sit top of the table for their trip to Cambridge on Saturday. Ellison's goals have helped the Lancashire side to wins against Dagenham, Newport and Oxford, and Bentley says the decision to make Ellison his first signing as Morecambe manager in 2011 continues to pay off. The 38-year-old said: "When I played against him, I had some right battles with him. We went 100% at it, both wanted to win and both got pulled apart a number of times. "That's why, when I first got the job, I drove to his house and made sure I wouldn't come out until he'd agreed to sign for us. "I think it's 44 goals he's scored for us now and this is his fourth season, so that's an unbelievable achievement."